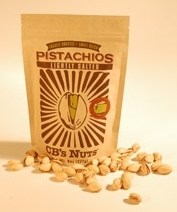 Learn more about CB’s Nuts on their website. I would normally suggest an iced tea with these, because snacking on pistachios seems to go naturally with iced tea, but, just for fun I decided to brew up a cup of this Honey Nut Biscotti tea from Kally Tea and drink it hot. The delicious, nutty flavor of the pistachios really brought out the nutty tones of the tea in a beautiful way. A really nice, somewhat unconventional tea time snack! While I love pistachios, I wasn’t all that excited about receiving a bag of these pistachios in the Boardwalk Box. I mean, I’ve had pistachios before, and I’ll be honest, I always bargain shop when it comes to these nuts. They aren’t cheap, you know? So, paying $7.00 for an 8 ounce bag of pistachios seems a little steep for me. All these thoughts occurred to me BEFORE I opened the pouch and tried my first pistachio. These are SO good… and seriously, they are better than any pistachios I’ve had in the past … err, with the possible exception of the Garlic Onion Pistachios … so I guess it would be more accurate for me to say these are the best roasted and salted pistachios I’ve ever had. The first thing that I noticed is that my hands are not covered in salt. These say “Lightly Salted” and they mean it. They are salted just enough to bring out some of the natural goodness of the nut without making them taste like a typical salty snack. Drawing from the theme of the Boardwalk Box from which they came, these taste as though they were seasoned by the sea air… salted, yes, but, they don’t taste like I just ran my tongue across a salt lick. And this makes a huge difference. I can TASTE the pistachio. As I mentioned before, I love the taste of pistachios, but this may be the first time I have actually been able to explore the true flavor of the nut uninterrupted by excess flavoring. The result is a delicious, toasty, sweet, nutty flavor. Now that I’m more than halfway through the bag, I’ve noticed something else as well. Every single shell is opened. With the bargain bags of pistachios, I usually find at least one closed shell out of every ten pistachios. That’s an estimate, of course, I’ve not actually conducted a study or anything. But based upon what the description from the CB’s Nuts website, a closed pistachio shell means that the nuts were picked too early. And the fact that these have been carefully selected and I’ve not found one shell that’s closed, that’s pretty impressive! I really liked these much more than I thought I would. I mean, I knew I’d like them, I love pistachios! But, I wasn’t expecting to be as impressed with them as I am. I didn’t expect them to be so different from the bargain bag of pistachios. But they are! And I love that these are a locally crafted product.